The International Cotton Advisory Committee (ICAC) is pleased to announce that Dr. Baohong Zhang, Professor of Biology at East Carolina University, Greenville, USA, is the ICAC Cotton Researcher of the Year 2018. ICAC honours a leading cotton researcher each year by awarding a certificate of recognition, a shield and an honorarium of US$1,000. Applications for the award were received from 1 February to 31 March 2018. An independent panel of experts reviewed the applications and selected the winner. Dr. Zhang grew up in a small village in China. Since childhood, he helped his parents in the cotton fields, which motivated him to work on cotton genetics and breeding. He graduated from China Agricultural University with a degree in plant genetics and breeding. He joined the Institute of Cotton Research at the Chinese Academy of Agricultural Science (ICR-CAAS) in 1991, where he pioneered the development of transgenic Bt cotton. In 2003, he attended Texas Tech University and received his PhD from the school in 2006, after which he joined the faculty at East Carolina University (ECU). His major focus areas have been to develop genetic tools, resources and studies on cotton small RNAs. Dr. Zhang developed an advanced CRISPR/Cas9 genome-editing tool and its application on cottongenetics and breeding. He is the first scientist who succeeded in employing CRISPR/cas-9 genomeediting technology to knock out an individual functional gene in cotton, including the fibre-relatedMYB25-like and miRNA genes. Aditionally, Dr. Zhang developed highly efficient approaches for cotton somatic embryogenesis, plant regeneration and highly efficient Agrobacterium-mediated genetic transformation systems in cotton. These powerful tools and resources open new avenues and provide directions for cotton researchers and breeders to perform cotton gene functional studies and molecular breeding. Dr. Zhang conducted innovative research on small regulatory RNAs and is a pioneer for cotton microRNA studies. 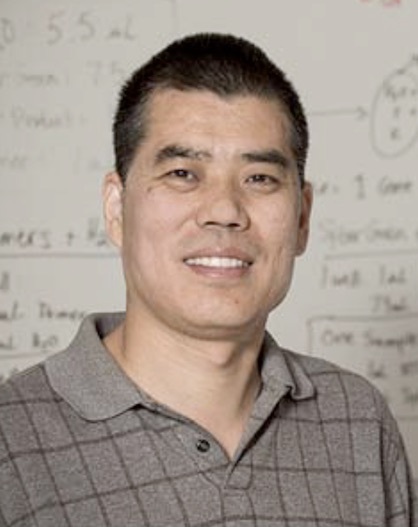 In the past 10 years, Dr. Zhang has been employing different technologies such as deep sequencing, transgenics, genome editing and bioinformatics to identify and conduct functional analyses of microRNAs in cotton fibre development to assess cotton responses to 10 different biotic and abiotic stress factors. He identified several microRNAs for genetic and breeding purposes. His results provide new targets for cotton improvement, including fibre yield and quality, as well as tolerance to environmental biotic and abiotic stresses. Dr. Zhang is one of the major contributors to breeding transgenic Bt-cotton in China. He developed 5 cotton cultivars that are being used in China and several other Asian countries. The cultivars continue to generate huge economic benefits for cotton farmers. Additionally, Dr. Zhang also created many elite cotton germplasm lines using transgenic, somatic variant screening and genome editing. Dr. Zhang has a highly impressive citation index of 10,460; h-index 46 and i10 index 104. He has been serving as co-editor-in-chief, associate editor and guest editor for 10 international journals, including Scientific Reports, Plant Biotechnology Journal and The Crop Journal. Dr. Zhang frequently reviews manuscripts for more than 100 international journals, including Nature. Dr. Zhang won ECU’s Five-Year Achievement Award for Excellence in Research/Creative Activity, the highest award available to ECU faculty members. He was also awarded early tenure and early promotion to associate professor in 2006, and then to full professor in 2012.